Awnings are primarily installed on windows or patios to protect us from the sun. Awnings are made from a variety of materials that all come together in a tightly woven fabric that blocks out the sun. The cloth material is stretched out between two metal rods usually made of aluminum or steel. Awnings are used by homeowners as well shop owners! Wilmington Building and Remodeling contractors can install all types of awnings at any place you need it. Customers should also know where to install awnings, the backside of a house that is usually shadowed is not a place where one should install an awning. Awnings are also used over a small part of outdoor pools and sun rooms! All awnings are tested for wind tolerance before they are sold, they can endure large gusts of winds! There are many types of awnings that are readily available to customers. The more popular type of awning in recent years has been the retractable awning. Retractable awnings also come in different forms, such as lateral arm awnings and drop arm awnings. Each type of awning has specific uses and one should educate themselves properly before choosing which type of awning they want. 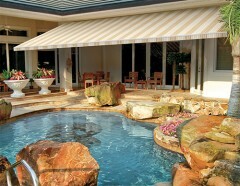 Retractable awnings are better considering that you have the option to either soak in the sun or just lie in the shade! Let us now discuss some of the more popular types of awnings! Pop up canopies are great to install in your backyard as they come in very handy for occasions such as barbecuing. A pop up canopy is very basic and can be used by children as well! Just slide it open and you have a perfect place for shade and leisure. The frame used in pop up canopies usually work with an accordion style truss which compactly folds up. Lateral arm awnings are the modern alternative to old storefront crank-up awnings. A torsion bar supports the tension arms and roller bar! The torsion bar is then fitted into the wall where it takes the load of the weight of the awning. Motorized arms for the awning are more prominently seen these days, but the hand crank lateral arm awnings are still available! The roller tube holds the motor for the awning. You can now also use a remote control to control the awning! Lateral arm awnings can extend up to 18 feet, and that is why they are also great for patios and homes! A shade screens main purpose is to block sun rays while providing some view-thru, hence a mesh fabric or acrylic canvas usually used. You can have either a motorized shade screen on a hand cranked one. The fabric stretched out by a weighted bottom railing between the guide rails. Using shade screens externally provides more protection from the sun considering that the suns rays are blocked before entering the glass rather than the other way around! You can acquire all of your awning needs with the best possible service from Wilmington Building and Remodeling. We cherish customer/provider relationships and are eager to work with anyone who needs a helping hand! Drop us a few words telling us what you need, or visit the Contact page for other ways to reach us.